I am a stay-at-home mother of two and have been for the last nine years. Our younger son Conor, who was born in 2002, has had many difficulties in his young life. When he was 10 months old, he was diagnosed with a bleeding disorder—his platelets don’t function properly. Often he would have unstoppable nosebleeds and other issues due to this disorder, requiring many hospital stays. 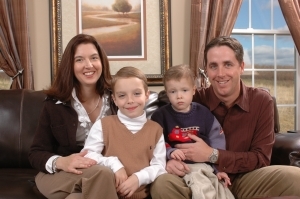 When Conor was 2, he was diagnosed with acute lymphoblastic leukemia. He also had cancer in his spinal fluid, which put him at high risk for relapse. Conor’s protocol was for three and a half years, and it was a grueling, uphill battle to beat the disease. During that time, we befriended many other families going through the same fight our son was in. Nothing in my life had prepared me for the emotional roller coaster that was then Conor’s journey. We were in a position where we had to watch young children lose their lives to cancer, and it really took a toll on what ultimately becomes important, life. Conor taught me that life is the most important gift and should be valued, even if many things are beyond control. The evening of the crash, I was up watching Conor to make sure he was not bleeding. He had lost a tooth earlier in the day, and I was worried that he may need to go to the hospital to have his doctors monitor the bleeding. I had just gotten him a glass of water and was settling him back to bed when my husband and I heard the crash, about a quarter-mile from our house. I could see the flames from our bedroom window and knew immediately that time was of the essence if we were going to be able to help someone. I started running for the car, and my husband phoned 911. When I reached the car, I didn’t think of anything other than getting the young man out. I think the danger of the situation caused my adrenaline to kick in, and I was able to wedge the door open, unbuckle him, and pull him to his safety, away from all the flames. He was already burned, and his breathing was erratic, due to smoke inhalation. I know that I saved his life, but I have to give credit where credit is due. My son Conor has taught me to act in a crisis. He has been such an inspiration in my life and he is the reason I was able to save that young man’s life. Conor is two years in remission from his cancer, but he will have to deal with the ramifications of radiation therapy and chemo for the rest of his life. He is a special needs child who has profoundly affected who I am today and who I was the evening of the accident. Behan, of Tivoli, N.Y., was awarded the Carnegie Medal in April of 2010 for saving a man from his burning car after a late-night accident near her home. She wrote this article for the June 2010 issue of Impulse, the Commission’s quarterly newsletter.